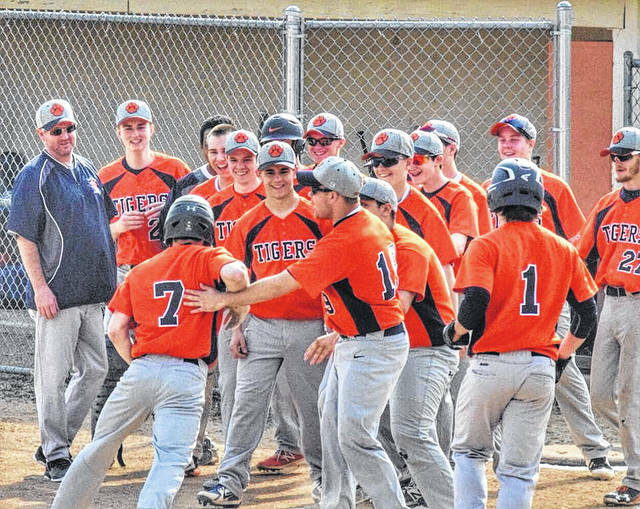 Photo courtesy of Angie Gibson Utz Galion’s Mitch Dyer (7) approaches home plate and a mob of teammates after belting a two-run home run on Friday as the visiting Tigers shutout the hosting Mansfield Senior Tygers; 8-0. MANSFIELD — The Galion Tigers baseball squad headed over to Mansfield on Friday, April 13 for a non-conference clash with the hosting Mansfield Senior Tygers. Galion would extend their winning streak to four games, easily defeating their hosts by a final tally of 8-0. The Tigers would plate eight on 12 hits while stranding six runners. Senior managed just three hits all game and stranded all five runners that reached base. Galion is now 7-1 overall on the season and currently sit at 2-0 within the Mid-Ohio Athletic Conference. Ryan Utz picked up the win for the visitors, going four innings while not allowing a single hit, walked just two batters and fanned eight. Spencer Keller worked the remaining three innings, gave up the three hits while striking out two. At the plate, Utz helped his cause with a single, two runs scored and a run batted in. Keller also recorded a single in three at bats. Mitch Dyer had a monster day at the plate for the orange and blue, going 2/3 including a two-run home run and a double. Dyer drove in three and scored once to round out his day offensively. Ethan Pigg and Cameron Payne also had multi-hit games for Galion against the Tygers. Pigg belted a pair of singles, drove in two, scored twice and stole a base. Payne also had two singles and finished with two RBI. Other offense for Galion in the win was provided by: Clay Karnes- 1B, SB; Kaleb Harsh- R; Carter Keinath- 1B; Wilson Frankhouse- 1B, R, SB; Matthew McMullen- 1B and Chase Castline- R.
The Tigers are set to play four games in the upcoming week, starting with a home contest against the Clear Fork Colts on Tuesday, April 17. Galion will then have a road game at Clear Fork on Wednesday before heading to Northmor on Thursday for a clash with the Golden Knights. On Friday, April 20, the Crestline Bulldogs will be in town to square off with the hosting Tigers. https://www.galioninquirer.com/wp-content/uploads/sites/38/2018/04/web1_Mitch-Dyer-HR.jpgPhoto courtesy of Angie Gibson Utz Galion’s Mitch Dyer (7) approaches home plate and a mob of teammates after belting a two-run home run on Friday as the visiting Tigers shutout the hosting Mansfield Senior Tygers; 8-0.